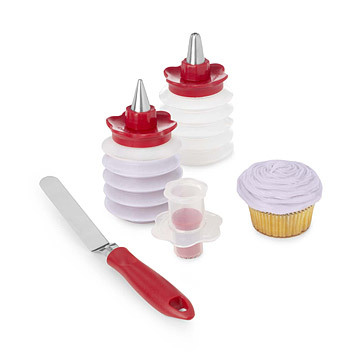 Make filling cupcakes a piece of cake with this easy-to-use set including the exclusive Cupcake Corer, two decorating squeeze bottles with tips and an offset spatula. Cupcake Corer: This corer creates a perfect hole in the center of the cupcake. Simply twist into the center, pull it out and push the plunger to remove the core. Squeeze Bottles: The easy-grip flower collar gives you a solid place to hold while you're working your decorating magic on your creations. The included round tip is perfect for writing and drawing patterns, and the floral tip is for filling the cupcakes and creating thicker designs. Click here to see the corer and the frosting. Check out the gift lab of the cupcake corer & decorating set on our blog! Purchased as a gift for an avid baker. It will get the job done, but I worry they won't last. I bought this for my sister who is a huge cupcake baker. She said it is the perfect kit for her, it has everything she needs to make amazing designs. The cupcake corer is a crucial element. It makes making stuffed cupcakes so easy! This product looks exactly like what the picture and description advertises. It comes in a nice box with good, sturdy utensils. Fancy-bakery gourmet cupcakes are yours! I love the gourmet filled cupcakes that cost $4 at the high-end bakeries. Now, I know I can make my own that compare pretty close to the storebought kind. The corer works great. The resulting little cupcake nuggets are tasty snacks, too, just dab them with some of your leftover frosting. My only complaint, aside from the difficult-to-get-every-last-bit from inside the squeezy bottles for cleaning...even when I had the lids screwed on firmly, the required pressure to squeeze the ganache filling into the cupcakes popped off the lid and left a little mess around the edge of the bottle. Otherwise, it's an awesome idea if you want your cupcakes to stand above the average. Your friends will love you for it! I work in a school for kids with severe disabilities, and have successfully used this product with students of all abilities. It's fun and easy for them to use! My sister loves to bake. This was the perfect gift for her! Purchased this as a gift for a teenage girl who loves to bake. She was so happy to get this and said it is easy to use. This is a great specialty gift for the baker who wants the tools to make "show-stopping" cupcakes. Includes directions on making a few variations, that probably stimulate other ideas. I suspect the two decorator tips require some practice to achieve the different effects. All in all, my recipient was delighted. I have no complaints. The item is as it is described; maybe even better! This easy-to-use set has two decorating squeeze bottles and tips (for writing or flowers), an offset spatula and a Cupcake Corer for fun, cream filled cupcakes.